7. Dog bed for the crate...from click here for many options. 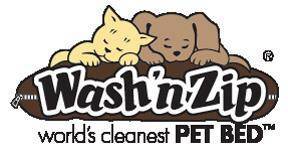 Wash and zip dog bed for crate, throw or just a dog bed is a wonderful option. Use Code CHARM to get an additional 15% off...I love these beds! Comes in several colors. 8. A dog crate appropriate for size, metal, can be covered for a cozy den,, often has divider's so grows with the pup.. plastic can be gotten at Pet stores, or Walmart/Target, also through Petflow or Chewys pet supplies..on line..Amazon sells them too! X-pen for safe area instead of a crate...downstairs. 9. Doggie bed ( not a must but some pups love them especially with bolsters), they wedge themselves in the groove. Chewys has a large assortment of fluffy dogs beds. Kauranda elevated dog beds pups and dogs love them great for outside or inside. 11. bowls ( stainless steal or ceramic are great! wash easily even in dish washer. Stay away from plastic, they can harbor bacteria. 16. 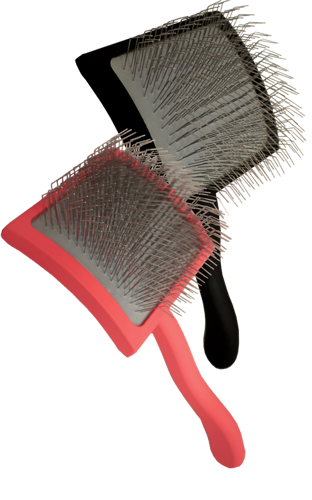 Brush to groom your doodle click here to order for quick touch ups with brush above. For the do it yourself groomer the Chris Christenson brushes below are excellent for dematting and and cutting grooming time in 1/2. More pricey but worth it if you like to keep your dog in a longer coat...click here to order. They also have many other tools. These are the brushes my groomer swears by now...a medium should do fine..
17. Order Terrific ear powder. This powder will prevent ear infections if used regularly especially after grooming and swimming. Click here to order. 19. 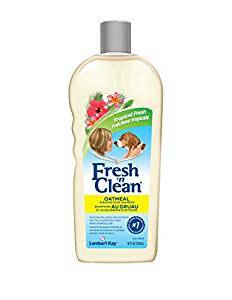 This is a shampoo recomended by my groomer.. Fresh N Clean Oatmeal tropical scent..
20. Dog ID TAGS! PLEASE order one for your pet! This is the best way to get your dog back quickly. Your pet will come micro chipped and this is a second line of contact. Pets name, your name, phone number and pups MC number should be on the tag..This web site ( same as above)has some super fun and creative ones for every taste and budget! 21. Lupine dog collars. These are great collars and the company will replace if damaged or chewed off! Lots of style options! 22. Leash and collar. I will be giving you your first leash and collar for your puppy....The ROK leash is my favorite lead when my dogs are adults...they are a bungie lead and they have a short handle to get your dog closer, if they accidently lunge and pull the leash will give and you will not be hurt...order the 6 foot one it seems to work best for strolls with your doodle...click here to learn more. 23. Dog waste bags for your walks with puppy.. Dog waste baggies..
26. Stella and chewy's meal mixers (beef) is a great additional additive to their food, or training treat. Click here to order and view. There are many flavors this is a freeze dried raw food product. Lots of other supplies for dogs, cats and humans can be found at the web site below...enjoy shopping!